I just googled ‘art quotes’ and the title is what caught my eye. I used to love art at school. And my mum tells me (and I do have vague memories) that when I was younger still, I liked nothing better than a pack of colouring pens and a pad of paper. And, after getting an ‘A’ at Art GCSE, enthused to carry it on for A level, my art teacher told me, bluntly, disparagingly, flippantly, not to do it. And I hadn’t picked up a paintbrush, colouring pen, pencil, piece of charcoal, since. I had been told I was not good at art, or not good enough anyway to take it for A level, and so I stopped. One woman. A few words. A huge impact on me. For YEARS. How many others are there out there in the world, not fulfilling their dreams, or even enjoying a pastime, because of a few words? This week, I was listening to Radio 4 Woman’s Hour, and they were interviewing a woman who has been affected by Trump’s new immigration law. She is Iraqi, working within the international community in research within tuberculosis, and was taking a holiday before starting a new research project at Harvard. And she was refused entry back in to America. Because she holds an Iraqi passport. So research for a disease that was one of the top 10 worldwide causes of death in 2015 (WHO report, 2016) was delayed / interfered with because of a flippant, disparaging attitude of one individual. This made me so angry. In the last couple of years, my kids started to be of an age where they enjoyed colouring, drawing, sticking and painting. And my daughter asked me to help her draw a cat. So, after trying every lame excuse in the book, and very reluctantly, I picked up a pencil and drew her a cat. Just the way I used to when I was just a bit older than her. And she loved it. She said, “mummy, you’re really good at drawing you know’. And, just like that, my faith in my creative abilities was restored, by a five year old who just so happened to be my daughter. A new regular at ToastLoveCoffee is Ian, a fab individual; genuine, kind, great conversations, and an artist…! 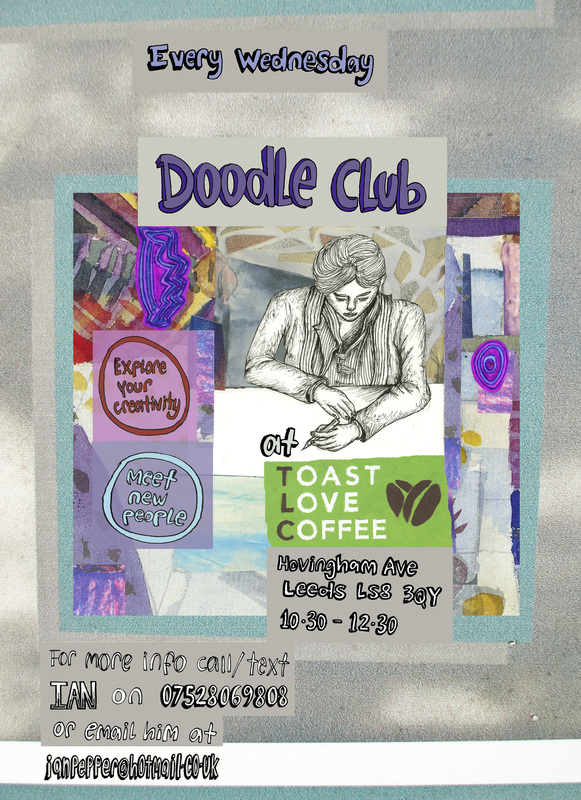 He has already gifted us some new handmade signs, and now, so keen to honour our ethos of creative ways of giving, he is giving with his skills; he is offering to host some art workshops at TLC for the next few Wednesdays. You never know, maybe you’ll find me there, doodling away, and fighting my own battle of resistance and stopping our beautiful Earth becoming just, ‘Eh’. What a great idea! For me it was my mother who said I couldn’t do art because I was useless at it. I wish she had lived to see my first solo exhibition in November/ December .